Back in February when I was in Atlanta one of the spots I wanted to check out was Ted’s Montana Grill. It is headquartered there and I figured that would be the best place to try it. Since that fell through I always knew if I made it to the west coast of Florida I would “need” to eat here. Just to give you a little back story on Ted’s Montana Grill. Ted’s Montana Grill was founded by Ted Turner (former media mogul and environmentalist) and George McKerrow Jr (Longhorn Steakhouse amongst other things). It’s known for being Eco-friendly (one of the first things I noticed when I was served my drink was a straw made out of paper, I don’t remember when the last time I had one of those.). What I appreciate about their Eco-friendly take on things, is best said on their website: “Will all of this change the world? Maybe, maybe not. But it’s the right thing to do.” Enough saving the world talk and let’s get to the food. My mother decides to start with a Tortilla Soup while I order Bar None Sliders, “Salt n’-Pepper” Onion Wings & Chili Cheese Fries. Momster loves the Tortilla Soup and while she’s slurping it up the other goods arrive. We’re also presented with a fresh whole pickle. Ted’s Montana Grill has a very steakhouse feel with a Bison head at the bar. Nothing says relaxation like a bodyless bison. I was kidding, I found the place to be rather relaxing for some unknown reason, maybe it was all the quotes peppered (yes I used that word) all around the restaurant. My parents asked as I’m sure you might be wondering also, why do I order Mini-Burgers or Sliders as they’re called here and a full size burger. The answer is most places of the place I’ve checked out have better Sliders than full size burgers. Why? A good 99% percent of the time the sliders are made in house while the burger patties are not. This was not the case with Ted’s Montana Grill by the way. The sliders came on a biscuit type bread with American cheese (one of them even had an American flag in it via a toothpick). Great sliders, really great. The “Salt n’-Pepper” Onion Rings were also great and I’m sure it has something to do with the fact this company is based out of Atlanta. Every restaurant in Atlanta seems to have really good onion rings. The Chili Cheese Fries had great fresh cut fries: check , good amount of melted American cheese: check , fresh jalapenos: check and bison chili on it: don’t order the chili . It was the one thing we came across we did not like, not because it awful but because it was slightly below average tasting. 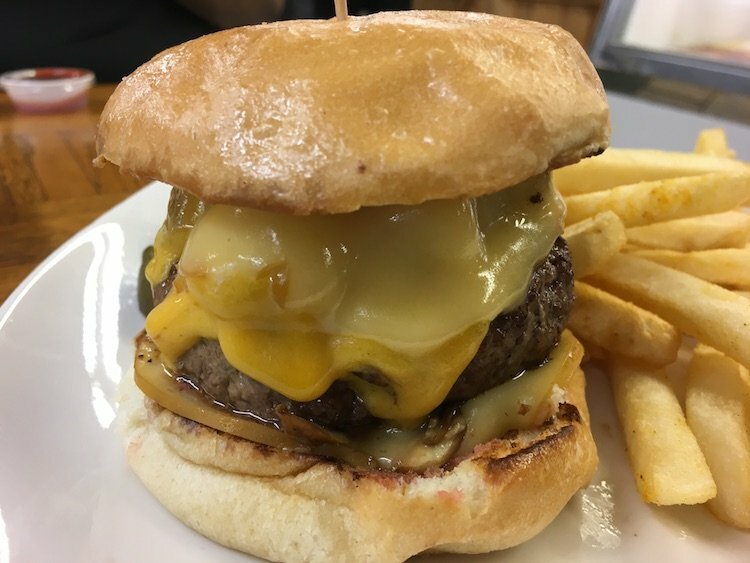 My wife Marcela had ordered a Chili Cheeseburger (cheddar cheese, grilled onions, jalapeno and bison chili) and after trying the chili decided to have the chili served on the side (it was left untouched). One thing about the burgers I didn’t mention you can either choose beef or bison and the burgers are served on kaiser buns. Getting back to Marcela’s burger, she loved it and I would have tried it but honestly the burger I ordered had all the trimmings. Both of my parents had the America’s Cup (American cheese, bacon, grilled onions & mushrooms) and were raving about it (talking highly of it not dancing in a weird manner). Oh Kitchen Sink, why are you so delicious? And it was, the Kitchen Sink has your choice of cheese (I had cheddar), bacon, grilled onions, grilled mushrooms, grilled ham and a fried egg. The burger tasted great and broke the sliders are better than full size burger theory. How many places do you know that can do that? The best Ted's to try is the one in Tallahassee. The Tallahassee store was built for Ted, bc he owns a home there. It was not meant to be a top producer, but it is. We've never had a bad meal. We're now stationed in Jacksonville, and the two locations here can't even touch the taste and service of the Tallahassee location! I have been here and I know you can also get chicken instead of beef or bison. Next time i have to go to the mayo clinic in Jacksonville i will have to track this place down and give it a try, you have sold me on the food! Thanks So much for the advice! I will check this out later this year! A favorite lunch stop of mine. I usually get the kid’s slider meal, $6 for 3 beef sliders and fries, $8 for bison sliders and fries. Their salmon is surprisingly good, too. $9 for the kid’s portion with 2 sides… it’s grilled on cedar plank, and you can actually taste that fact. This location closed. I would have loved to hit it up a second time.